Sometimes the simplest things can be the most striking, and one of these is an incredibly simple stick figure Halloween costume. This creative costume is sure to be one-of-a-kind at any Halloween bash. It's also easy to create. You can even put off preparations until the day of the party. Start the mask. Get a thick, white paper or plastic disposable plate or another rounded, white object. 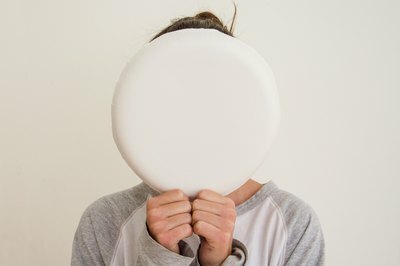 You can use foam core, poster board or any other piece as long as it's cut into a circle large enough to cover your face. Hold the object in front of your face and mark where your eye holes need to be. Draw two circles with black marker around the eye hole area and cut out the center of the eye holes. Draw a dot below and between the eyes for the nose. Draw a mouth using an upturned, downturned or jagged line, depending on the expression you wish to have. Poke a hole in either side of the mask, right above the ears. Reinforce the back with duct tape. 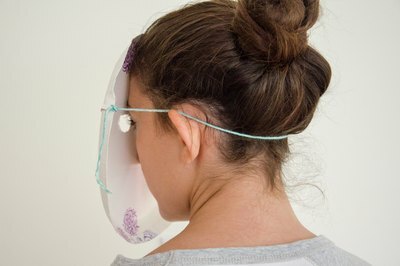 Cut a piece of string that reaches from each side of your face above the ear to around the back of your head. Thread string through the holes, knot to secure. 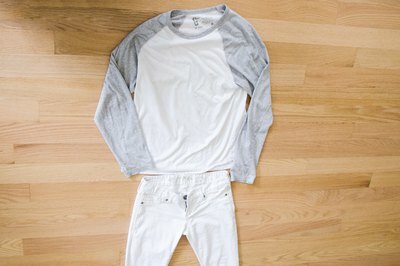 Choose an all white or other light-colored outfit. The best combination would be a long-sleeved T-shirt and pants or jeans. Lay the items face-up on the floor in front of you. 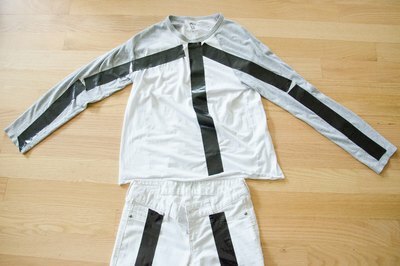 Cut pieces of duct tape to attach to the outfit and serve as the sticks in the stick figure. One piece of tape should reach from the center of the neck to the center bottom of the shirt. One should reach from each center line down the arm to the elbow. Another should reach from each elbow to each wrist. 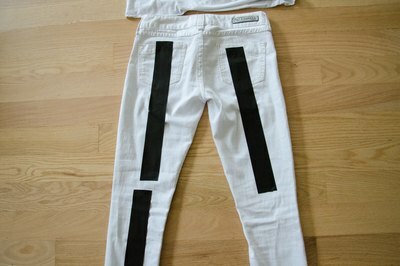 Legs should each have one strip of tape from the center of the waist band to the knee and another from the knee to bottom of the pant leg. Hook up the other side of the body. Flip the outfit over and repeat the tape outline for the back of the garments. 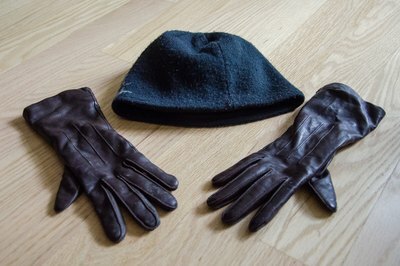 Add a little jazz to the outfit with a bowler or other hat, black shoes and gloves that have fingers created with snipped duct tape.